In 2015 Entrance Matting Systems began searching for agents in the Middle East. We invested time and energy into finding a suitable company who we could work with. Our first point of call was the UKTI (UK Trade & Investment Agency) to both seek advice and ask to see if they could give us any leads in the region. Our next point of call was to contact the companies we work with in the UK who had branches in the Middle East (Carillion, ISG, Mace, Kier to name a few) to see if they could put us in touch with anyone who could point us in the right direction. Several months and lots of e-mails and Skype conversations later we eventually got a break, we were told to contact a company called Sahaba General Trading who were based in Dubai, this company had a lot of contacts within the hospitality industry and sold products directly to hotels, the thinking was we could start to get our products into hotels which could lead to other work. The Owner of the company; Mr Bala Sahaba also had a consultancy company in Kuwait and through this a lot of contact with Architects and Construction Companies. We offered Sahaba General trading all the technical support he needed along with exclusivity for (initially) one year and preferred supplier rates, this coupled with the marketing support we sent across gave him all the necessary tools to push our products in the Middle East. We started to quote a lot of companies on their projects offering alternatives to the entrance matting which was in specification. Meanwhile Bala was working behind the scenes with the architects/designers in the hope that we would start to see our entrance matting on the specifications. In the middle of 2016 we achieved specification for our EMS Anodised Tretford Design matting for Harvey Nichols – Kuwait. The sub-contractor was Havelock AHI Interiors LLC which are based in Abu Dhabi. Bala met with the director of Blueprint Kuwait to explain our systems and negotiate a deal we were all happy with. The order for the Harvey Nicholls store was placed September 2016. The manufacturing of the entrance matting was quite a complex project; our extruded aluminium panels were sent to be Anodised black, during which time the logo was being designed and cut from the Tretford material. (The lettering colours was Jonquille and the back ground colour was Anthracite. Once the panels were returned the manufacturing process began. The mat was manufactured oversize so it could be cut to shape on site; the whole process took approximately two weeks start to finish. In order to ship the matting we had to produce a certificate of origin, legalised invoices and a certificate of conformity. Fortunately for us the client organised for their courier to collect the entrance matting from Lincolnshire; it was delivered to Kuwait in good order 6 weeks later. Before installation we had in-depth conversations with Blueprint Interiors and were also on standby over the Christmas period to deal with any questions or situation that arose when they were installing, it was installed without issue. 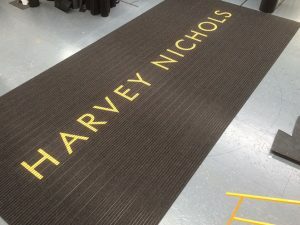 Harvey Nichols London has since seen photos of the project and have asked for Entrance Matting Systems to quote for similar in their store. In the mean time we are in constant contact with Bala, quoting on lots of projects in the Middle East, we are looking forward to an exciting future for EMS in the Middle East. FOR MORE INFORMATION, CLICK HERE TO GIVE US A CALL. The Blade. Bespoke Anodised Aluminium Entrance Matting System.